Democratic socialism is hot in the United States right now. Both the American media and young people seem to be enamored of the thought of steeply progressive, redistributive tax rates designed to achieve some vision of justice. As with most public policy ideas, we tend to get pretty far down the road before we ask basic questions related to the project. In other words, we imagine a result that appeals to us before we’ve really considered whether other effects are likely and whether the proposal is morally right in the first place. While John Rawls makes an argument along those lines — essentially, that no one really deserves their money because they didn’t control the family they were born into, their genes, etc. — there is a reasonable argument to be made that many people with such advantages seem to fail, while others who lack those advantages seem to succeed. In other words, attributes such as determination, hard work, the willingness to delay gratification, conscientiousness, and others may well matter more than whether one was born into a family of means. Countries that impose high taxes often find that they end up losing some of the best payers of taxes as they move elsewhere. The same is true of corporations who seek to preserve capital from taxes. There will always be nations who offer more competitive rates of taxation. 4. Related to question #3, do we realize that governments exist in a competitive landscape, very much like businesses do? If one government offers a bad deal—high tax rates, inadequate value for taxes, etc.—then citizens and companies who can move will They will select a friendlier sovereignty. Unless you want to be a nation who builds walls to keep people in rather than out, you have to give good incentives to stay. There is a reason the toughest places to leave are also the places many people would like to leave. They have been captured and effectively enslaved. In other words, while it sounds good to impose a wealth tax that can bring trillions into the treasury, do we have a right to do it? The right can’t be created simply by the fact of a majority voting for it. We should all recognize that majorities do not automatically vote for just results. So let’s double down here a little: Why exactly are we entitled to a large share of someone else’s earnings? Is it the mere fact of someone else’s need? If so, then we should authorize on the spot confiscations whenever an immediate need is obvious. Steeply progressive tax rates provide a substantial disincentive to earn income above a certain level. The natural result would be to opt for more conservative returns from known methods and products. There is little reason to take risks for breakout success when the profits will be subject to a confiscatory rate. Should entitlements be reconsidered? Should the defense budget find a lower level as the United States seeks to share responsibility for international order rather than being the primary one to shoulder it? Should we make greater use of localized governments where citizens can make choices for either more or less government so we can judge the effects in the great laboratories of democracy? 9. Are we getting taxation wrong? Isn’t taxation really about funding the government rather than redistribution or some kind of social realignment? Are we looking to the tax system as a substitute for individual morality and stewardship? Is the tax system actually alienating in the sense that it applies some kind of automatic transfer to an arena that should entail real connections among people in communities? Hunter Baker, J.D., Ph.D. is an associate professor of political science at Union University and an Affiliate Scholar in Religion & Politics at the Acton Institute. He is the author of The End of Secularism and Political Thought: A Student’s Guide. 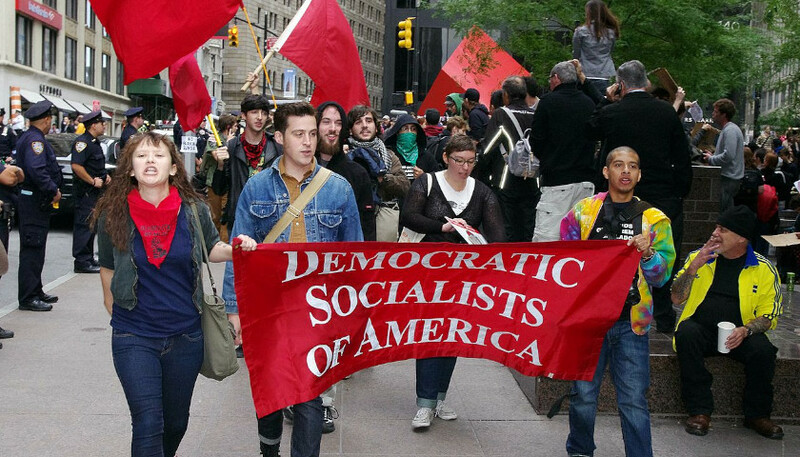 Photo “Democratic Socialists of America” by David Shankbone. CC BY 3.0.